Located in Brooklyn’s Greenpoint neighborhood, Newtown Creek Wastewater Treatment Plant is the largest of New York City’s 14 wastewater treatment facilities. It is situated on 53 acres and serves more than 1 million people in parts of Brooklyn, Queens, and Manhattan. On average, the facility treats about 18% of New York City’s wastewater, or 310 million gallons, each day. When it rains, the capacity more than doubles, to about 700 million gallons. New York City’s wastewater treatment system treats approximately 1.3 billion gallons of wastewater daily. Learn more about the Wastewater Treatment System and Combined Sewer Overflows. 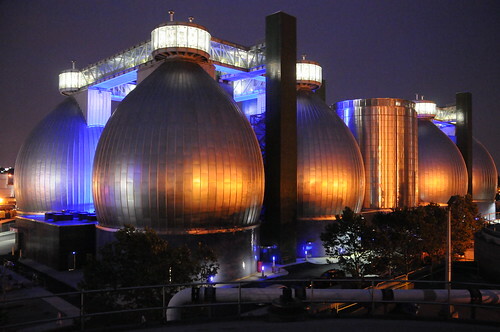 The Newtown Creek Digester Eggs are the award-winning landmark that has risen from the Brooklyn waterfront of the East River. The visitor center, designed by Vito Acconci, serves as a destination for school trips, and features installations describing how the city’s sewer system works. The George Trakas–designed Waterfront Nature Walk provided the first public access to the Newtown Creek waterfront.